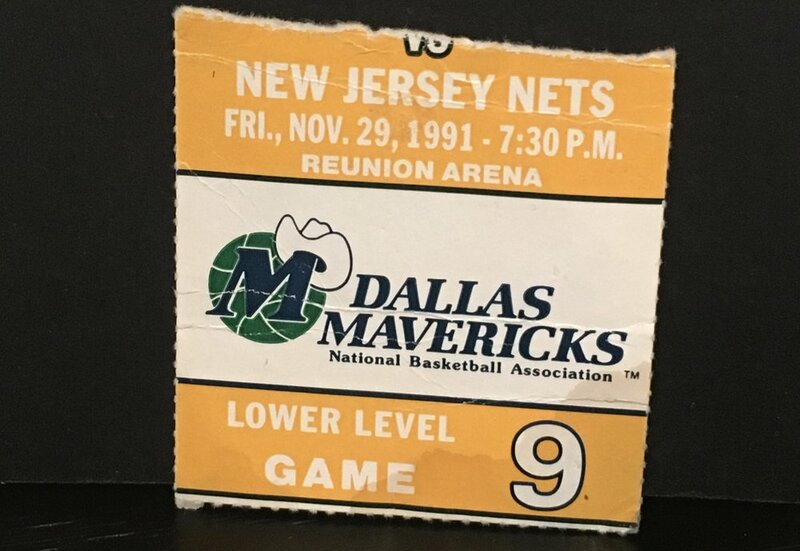 I attended my first basketball game on November 29, 1991, a high-stakes tilt between the lowly New Jersey Nets and the lowliest-of-lowly Dallas Mavericks. It was my second true sporting event ever, preceded only by a truncated Texas Rangers game that featured A) a drunken brawl on Bat Night (as in, “everyone got a free bat”, not “Batman showed up”), B) my little brother catching a beer in the face, and C) not much else worth remembering. There were no drunken brawls on November 29, 1991 (to my knowledge), Batman did not make an appearance (to my knowledge), and according to basketball-reference.com, very little of note transpired. The Mavericks lost, something they got very good at over that season and the next eight seasons to come, Derrick Coleman missed the game for the Nets as he was wont to do, and the 16,000-odd people in attendance mostly meh’d, unimpressed by the effort. In my heart, however, November 29, 1991 is a line of demarcation at which point my life became profoundly different. There was “Before Basketball” and then, suddenly, there was “After Basketball” (he says, in the least sacrilegious way possible). The events of that night, completely inconsequential in the macro sense and almost just-as-inconsequential to even the most hardened basketball fan, quite literally changed my life and sparked in me an absolute obsession for the sport that has (occasionally) brought me the greatest joys and (much more frequently) laid me so low as to curse the day I ever started watching this stupid game in the first place. On that night, I marveled at one player in particular. He wore number 12 and he played the game at a different pace than the rest of his teammates. With 26 years of understanding and hindsight to my benefit now, I can see why: that Mavericks team was horrendous and, with Rolando Blackman injured, most of the roster was either woefully past their respective primes or so untalented as to never actually warrant a prime in the first place. But number 12…well, he was different. He attacked the Nets on both sides of the floor. He was tenacious. He was intense. He played with a certain poetry-in-motion that so many of the other players lacked. My understanding of basketball was extremely limited at the time but to me, there was a clear, distinct difference between number 12 and literally everyone on the floor. I was mesmerized by Derek Harper and everywhere he went on the court, so, too, did my vision. For the next two-plus seasons, Harper was virtually the only reason to watch a Mavs game and I watched them all, loss after loss, humiliation after humiliation. Someday I’ll write a book about the hard lessons learned through my first 10 years of Mavericks fandom which featured, I think, 100 million losses in total. Still, I was locked in, night after night, in part because I loved basketball like no one has ever loved basketball, and in part, though I was too embarrassed to ever admit this to anyone, because I felt like I needed to support my hero. Like, somehow through the Cosmic Basketball Force, a very good professional basketball player would feel an undersized-but-scrappy little basketball player cheering him on and hoping against hope for a win that night and it would lift his spirits. Virtually every kid I knew who cared about basketball in the slightest (and that wasn’t a given in early 90’s Texas) rooted for the Bulls and worshipped at the feet of Michael Jordan. My best friend was a Knicks fan, I knew another kid who loved David Robinson, and one weirdo who exclusively supported Vernon Maxwell (this kid became a serial killer, I am certain of this) but I legitimately didn’t have a single friend who cared about the Mavericks or my beloved Derek Harper. I admired all of those players but I wanted to be Derek Harper and patterned my very mediocre little league game after him. I wanted to shoot like he did, I wanted to attack like he did, I wanted to yell at both opponents and teammates like he did (whoops), and I wanted to defend like he did. Oh, how I loved his defense! The NBA logo might as well have been Derek Harper handchecking some poor opposing point guard into oblivion as far as I was concerned. I wore number 12 on basically every jersey I ever received and still, to this day, if I’m on a slow pitch softball team or some other spare excuse for sport, I’ll politely demand number 12. This remains my tiny ode to the man who has as much to do with my sports obsession as anyone. On January 6, 1994, in the midst of what would become a wretched 13-win season (13 is not very good, in case you were wondering), the Mavericks traded Harper to the Knicks. I was 10 and this was the worst day of my young life (which is to say my life was not so bad) and the first time I can ever remember crying for reasons beyond bodily injury or tantrum-throwing. I was devastated. I can’t remember if I went to school the next day or not; in my mind, my parents let me stay home in my broken heartedness but that’s doesn’t seem like something they would have done. Regardless, whenever I did return to school, I distinctly remember my friends, one by one, coming up to me at my desk or on the school yard and consoling me, like I’d lost a parent (or at least a pet). I’m not sure there’s ever been a kid who loved his sports hero like I loved Derek Harper. I followed Harper to the Knicks, splitting my fandom a bit, which violated everything I held dear as a zealous young sports fan but I justified the move by allowing that A) the Knicks were in a different conference, B) the Mavericks were historically terrible, and C) I was allowed to support my hero as passionately as I pleased, regardless of whether he played for my team anymore or not. This shift to the Knicks ultimately led to even more heartache (seriously, sports are the worst) when New York lost in the NBA Finals that summer, sabotaged from within by John Starks, whom I will never forgive. I remained loyal to Harper through the next two years in New York, then his return to Dallas in 1996, then his move on to Orlando in 1997 and even the bloody Lakers in 1998. When he retired as a member of the Mavericks in 1999, I cried, the uncoolest of moves for a 16-year-old but an honest one nonetheless, and I mentally resolved that, no matter the circumstances nor the cost, when the Mavericks retired Harper’s number 12, I would be there. Fast forward 18 years and things have changed. The Mavericks have a ring, something 10-year-old Brian never thought possible. I’ve made room in my life for new heroes; Dirk Nowitzki, Bill Murray, and Conan O’Brien to name a few. And, of course, I have a four-year-old kid shadowing me wherever I go. But I remain resolute in my dedication both to the Mavericks and Derek Harper himself. I have no idea why it took so long, but when the Mavericks finally announced their intention to retire number 12, I bought tickets and dug my old Harper jersey out of storage (still fits, what up). On Sunday night, I sat in the American Airlines Center to witness the bestowing of one of sport’s greatest honors on my childhood hero, accompanied by my wife, a friend, and the aforementioned child. I listened to the words of those in attendance who spoke of Derek Harper’s virtues as a player and a man, stood and applauded when he took to the podium, and cried more than I’d like to admit when the number 12 banner was uncovered and raised to the rafters. My son doesn’t understand what this night was all about. He spent most of the evening eating cotton candy and taking pictures of Dirk Nowitzki with his pretend phone. During the ceremony, he patted my leg and asked me why I was crying, though he is no stranger to Sports Tears as I am neither shy nor cautious with my guffawing. He listened dutifully as I briefly explained who Derek Harper is and what we were doing here. And then he went back to his “big salty pretzel”, content as always. I have no idea what the future holds for him, whether he’ll be an athlete, a musician, an engineer, or some combination of them all. All I can do is expose him to events like this, encourage his interests and pursuits, and hope he finds his own Derek Harper to idolize.